I mentioned last time that I might have a Barbie...or two. And the "or two" usually means that there WILL be two but let's just start with one for now. The beautiful Aqua Holiday Barbie! My mom every year gets me the Holiday Barbie and I always get the blonde doll because I have blonde hair. :) love it. The Holiday dolls this year are in non-friendly boxes so there is no way to get them out for deboxed photos. I like the different packaging and how it looks like a snow globe but I would have opted for a generic square box so I could take them out but not take them out. I don't know how you feel about the holiday dolls this year but they really didn't sit well with me. 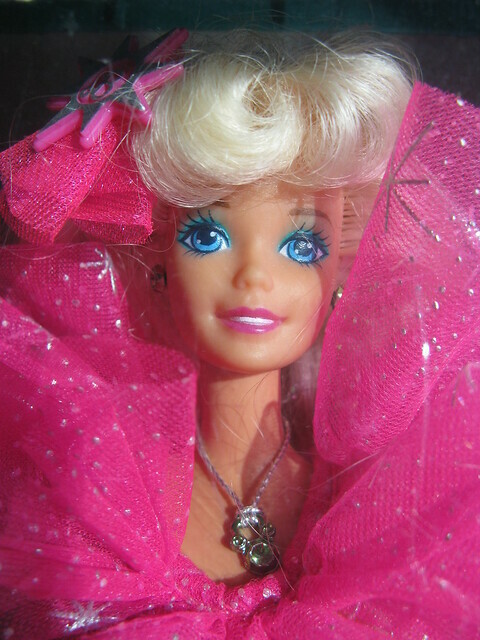 Barbie is all about the foof and fluff and glitz and glamour that the Holiday season brings. These just seem kind of lackluster! Here is the very first thing I noticed. Absolutely NO jewelry. No earrings. No necklace. All we have is a bracelet. If they are going to skimp on the jewelry they could have given us rooted eylashes. Am I right? She has very simple makeup and hair that is pulled back and curled on the ends. I like the softer hairstyle. Sometimes the "Holiday Barbie Hard Hair" is too much! I did want to make note of the plastic upper. This was the second thing I noticed. Plastic on the dress? Come on! Since I'm not taking these out of the box I can't say how pliable the plastic is but from watching an unboxing of the doll, the plastic is tacked on the sides with some thread so the back just has the velcro for the dress. I'm not sure how this is going to hold up with regular play. If you zoom in on the photo, you can see that her upper is a mix of stars and snowflakes. Unlike the plastic upper, I LOVE LOVE LOVE the ombre skirt. And the aqua gives us a little change from the bold red dress we've seen the last couple of years. And it's sparkly. Love that. 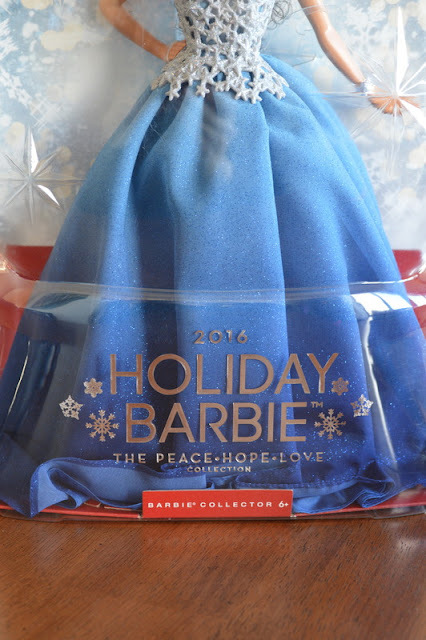 The back of the box reads: "The Peace, Hope, and Love Collection captures the magic that fills our hears this time of year. That's why there's not one, but a trio of lovely Holiday Barbie Dolls. 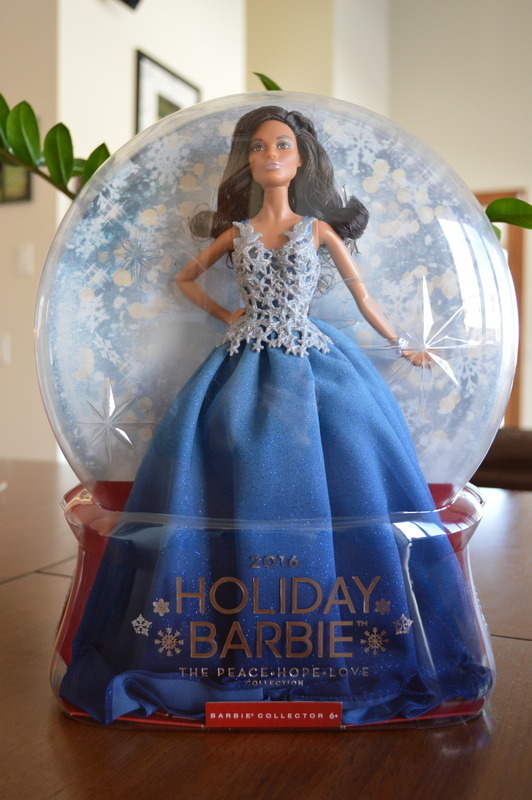 Each doll, showcased in her own "snow globe", is dressed in a festive, jewel-toned gown embellished with a sparkling bodice, and matching shoes. May they bring you joy and the happiest of holidays!" I hate when I feel this way about the dolls. 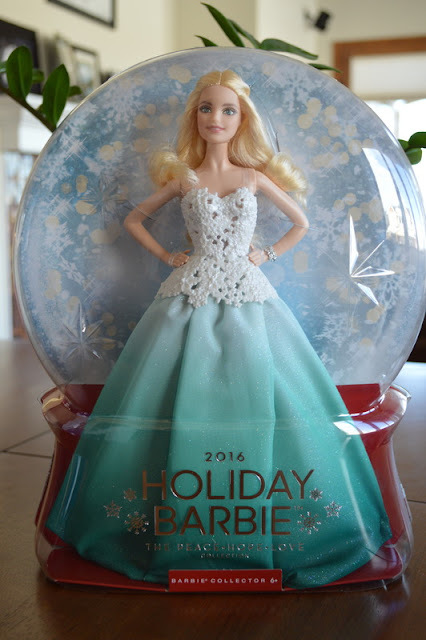 I love the Holiday Barbies and they hold a very special place in my heart. 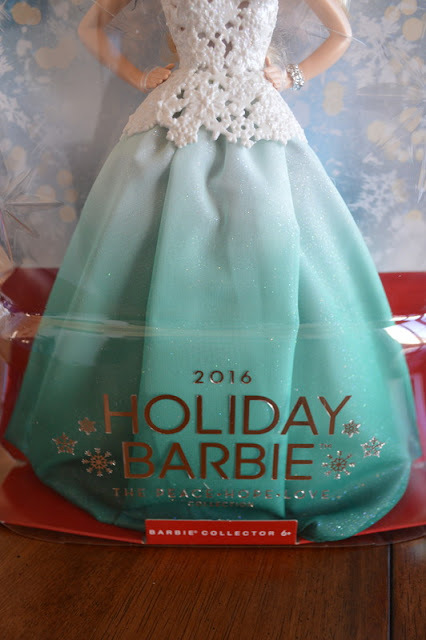 Me and Holiday Barbie go way back to the beginning. Back when I took them out of the box, brushed their hair, changed their clothes so they could have a slumber party then got them all dressed up again so they could go to the ball. Remember my first? The aqua really is a pretty doll. I do love her. But wouldn't it be great to get a Mackie doll again? So, this year there were three dolls. I had a gift certificate from Mattel so it was only natural to get another one of the colors. The day after Christmas I checked two stores only to find all they had left was the Aqua color doll. Until one day.... I went to Wal-Mart and they not only had the blue, but also the red doll (and no Aqua. How's that for luck?) Which did I choose? I kind of fell in love with the face mold of this one. 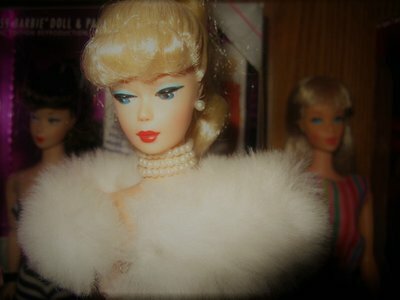 This is a very beautiful doll! 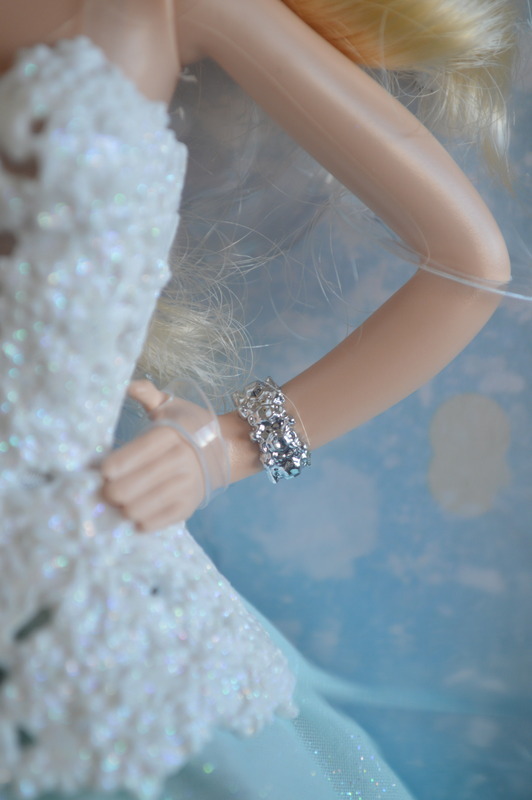 She does not have any jewelry like the Aqua doll except for the bracelet. Her plastic upper is different. This one is designed with stars and has birds at the shoulders. I like that! 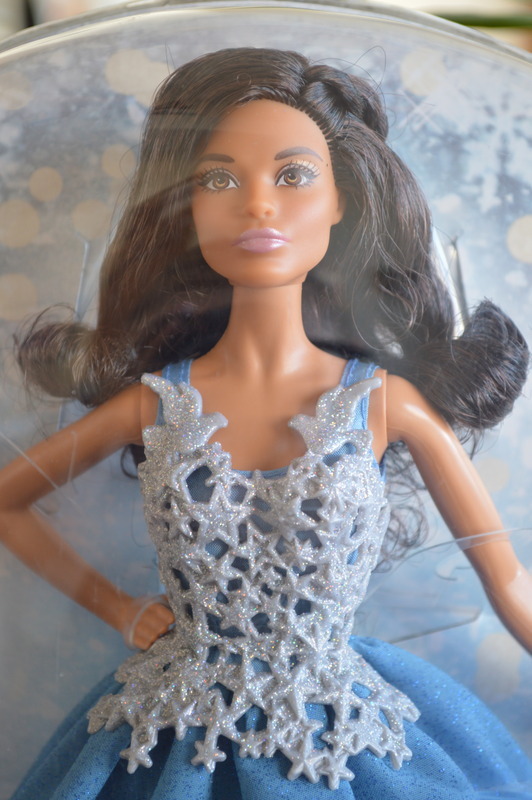 This doll has a blue ombre skirt. It's not a navy but more of a deep royal blue. Love the color! So there are my two dolls for today. But wait! My wonderful mom bought me the red AND blue dolls when they were on closeout after Christmas. How sweet is she? So now I have two of the blue dolls :) I'll find a little girl to give it to. The red is gorgeous too. Her upper is really hard to tell exactly what it is. Some kind of foliage and flowers (I think.) The very bottom of it by her waist reminds me of Oak leaves. She also has a pretty face. And this is not a "red" but more towards burgundy. (The true color didn't come out in the photos. Looks more red.) We've had some burgundy dolls in the past and I've always loved them. The perfect holiday color. So this is the 2016 Peace, Hope, and Love Collection. 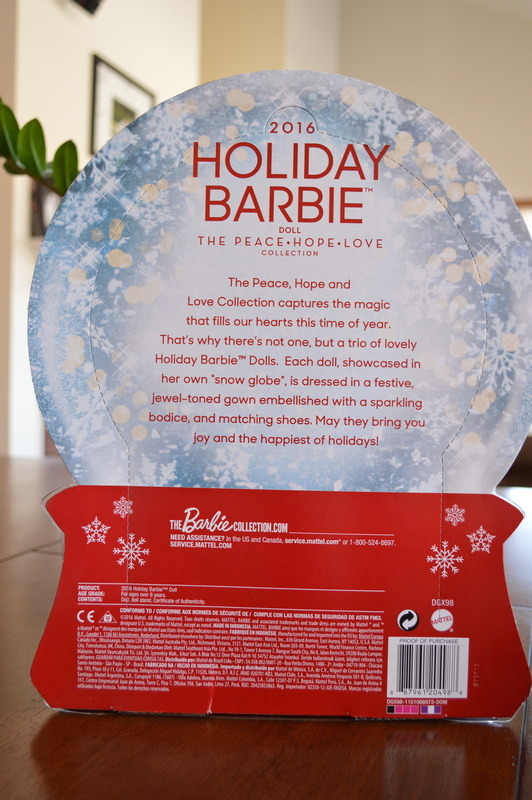 I tried to find out which color is peace, hope, and love but the Barbie Collector website does not say. As I mentioned, I do love the dolls and they are pretty and have sweet looking faces. Loving the ombre skirts for sure! So friends, did any of the Holiday dolls make their way into your collection? What did you think of them this year? Let me know in the comments! Well, the sculpts are different too! Aqua is Millie (I think), Blue is Claudette and Red looks like Teresa. I was lukewarm about them, but they look better than in promo photos and all have nice faces. Too bad you canțt take them out, I think they would look better without the plastic stuff. They are pretty. i would not like the plastic top. I notice too the aqua and the red are smiling, but the blue one... to me looks almost angry. Either way you rocked in the Barbie department! Hi BlackKitty, I took a look at the promo photos and they do look way better! Why cant they make them look that way when they get to us? I was wondering if the red was Teresa or not or just a Brunette Barbie. I was unsure of the AA doll. Thanks for recognizing her as Claudette! Kristina, I hear you on the price. I told my mom not to buy her at the $40 price point, it was just way to expensive for what you get. But she did anyway (the Aqua one.) It is up there with Fashionista quality but with the Fashionistas you at least get jointed elbows and knees! I wasn't impressed when I saw the promo pícs, so for the first time in this series I opted not to buy them. It's the chunky plastic tops that spoil the look for me and the plastic packaging looks pretty cheap compared to the beautiful boxes we are used to. Since the possibility of a glue head is also pretty high, there were to many downsides for me. I do like the face of the blue one, a new face is always a nice surprise. Oh a glue head. I didn't think about that. You're much better off with the deluxe Fashionistas. Rooted eyelashes are to die for!